Garages provide homeowners with protection and comfort, while sheltering vehicles from the elements. Garage door openers usually perform so flawlessly that they are often taken for granted until there is a malfunction. A clicking noise emitting from a garage door opener may indicate a variety of problems ranging from simple to complex, but identifying the breakdown is the first step to restoring the garage door opener to working condition. Issues with the sensors can cause clicking noises on the garage door opener. The garage door opener may be making clicking noises as a result of the security lock. Other symptoms may also include flashing lights on the remote control opener. 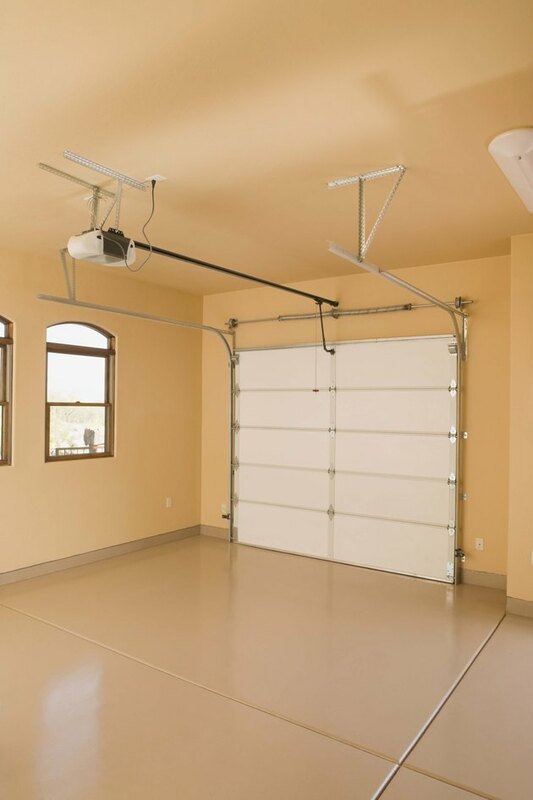 On some systems, the garage door opener installed on the wall will override commands from the remote control opener, and the system must be unlocked from the wall pad. A faulty circuit board will cause the garage door opener to make clicking sounds. Also, the opener may work sometimes, but on other occasions, it does not respond. A power outage or surge -- particularly one that results from a storm -- may either cause a temporary malfunction or permanently damage the circuit board. Garage door rollers that have worn out may also cause clicking sounds from the opener. In addition, there may be a grinding noise when the door is opened and closed. According to the website 513 Garage Door, rollers have an average life span of 15,000 cycles, and if you open and close the door roughly 7 times a day, your rollers will wear out in 7 years -- which is the same life span for the door's tension springs, so both the rollers and springs should be replaced at the same time. Clicking sounds from the garage door opener may also be caused by issues with the photosensors. These garage door safety sensors are located close to the ground and are responsive to any potential obstructions. If the sensors are hindered by anything, including something as simple as leaves or other debris, the garage door opener will emit clicking sounds, but the door will not open or close.